Like ocean cruising, river cruising is very inclusive, with accommodation, food and entertainment all included in the price. Providing fantastic value for money, especially when compared to land-based holidays, river cruising still enables you to get to the heart of a destination the same way you would on a city break. The inclusivity of river cruising isn't the only reason it’s become so popular however; here we look at some of the top reasons why this type of cruise holiday is on the rise… No choppy seas – with no waves or currents to contend with, river cruising is the perfect choice for those worried about seasickness! Daily Excursions – are often included in the price, with operators such as AmaWaterways even offering free bicycles for independent exploration. Exotic far flung destinations – are being added to operator itineraries every month, with river cruising not just confined to Europe. Cambodia, Vietnam, Laos and China are increasingly popular, with Myanmar set to follow suit. A room with a view – is guaranteed on river ships, with all cabins being outside and most with large windows or French balconies, meaning that you will never miss the view! Small and friendly – is the name of the game when it comes to river cruising. Most hold less than 200-250 passengers, making it easy to meet like-minded friends if you wish. Fascinating talks and insights – are often given whilst your vessel sails by towns and cities, with onboard tour managers happy to answer any further questions you may have. What’s included in river cruising? While accommodation, food and entertainment are a given, river cruise companies can vary enormously in terms of ‘what else’ is included in the price. Many include flights or a rail option as well as local transfers, while others charge a supplement. Unlimited wifi access is also something that more and more operators include free of charge, as well as free, guided shore excursions. All-inclusive drinks packages, again, are growing in popularity amongst luxury river cruise operators, while others will include wine or beer with meals and unlimited soft drinks. The popularity of river cruising continues at a relentless pace, with Burma remaining the ‘hot’ destination for many operators including AmaWaterways, Viking and Avalon. But outside of Asia, there are plenty of other rivers rising to the top of people’s must-cruise list! The American Queen Steamboat Company has put the stunning scenery of the Pacific Northwest on the map. Here, the Columbia and Snake rivers wind their way through rolling hills, mountains and deep gorges, past wild bison and elk, grazing along the water’s edge. The Colombia river takes you past many points of interest including the Sacajawea National Park, spectacular Cascade Mountains and the historic cities of Portland and Astoria. The Snake, is the largest tributary of the Columbia River and was created through volcanic activity from a hotspot lying directly underneath Yellowstone National Park. Back over in Europe is the river Tisza, flowing across the Great Hungarian Plain into the famous Danube. Only recently opened to international navigation, following the integration of Hungary into the European Union, the Tisza rises in the Carpathian Mountains, flowing Northwest through Ukraine and onto Hungary, meeting the Danube near Novi Sad. River cruises along the Tisza generally form part of a dual river cruise along both rivers, with plenty of opportunities for excursions into the neighbouring wine regions! Finally, Germany’s historic Pomerania region plays host to another off-the-beaten track river route; the river Oder. Flowing through Western Poland, Germany and the Szcencin Lagoon, bordered by the islands of Usebom and Rugen, the Oder finally empties into the Black Sea. River cruises generally offer somewhat calmer waters along with the chance to explore some of the world's more inland destinations. 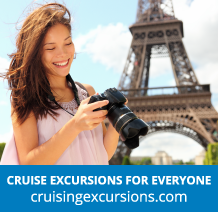 Whilst river cruising is great for people who are worried about their holiday being ruined by continuous bouts of sickness, they still offer an unmistakable cruising experience and levels of comfort and luxury equivalent to those found on the large ships that are built specifically for ocean cruises. Step aboard one of these elegant cruise liners and explore some of the most famous rivers in Europe and the rest of the world. Discover the delightful Douro, the romantic Rhone or the serene Seine as you soak up the friendly atmosphere on-board. And if you can't get enough of this grand lifestyle, we have plenty of luxury cruises for you to look at. Our top operators include AmaWaterways and Viking River Cruises, so head over to their pages to find more great deals.